When selecting a head, one wants to pair the legs with a head that will not compromise the stiffness of the system as a whole. On the other hand, a head that is too big adds diminishing performance increases and just adds weight. The LN-324C is a decently stiff tripod and so wants at least a mid-size ball head. The tripod weighs enough though that there is very little downside to just using a full size head, which typically has better ergonomics. 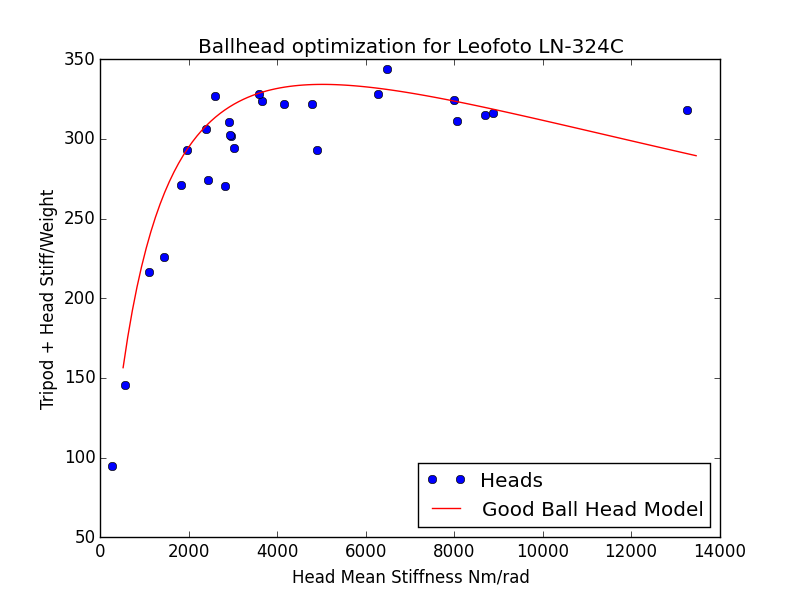 This chart is telling us that you want to pick a ball head that has a stiffness of at least 3000 Nm/rad. Heads around this range are typically smaller than is appropriate for these legs though. Not that there is anything wrong from a performance perspective, but it looks pretty silly to have too small a head and you may as well get the ergonomic benefits from a larger head. As we can see there is very little overall performance drop from getting a full size head in the 6000-8000 Nm/rad range. Sirui K-30X The K-30X is just a smaller version of the K-40X. Purely from a performance perspective, this is the best head for the LN-324C. It is plenty stiff and is significantly lighter than the K-40X. On the head ranking page, you can see that there are quite a few mid and full size heads with the requisite stiffness to perform well with this tripod. Most though are over $300. If you are considering one of those heads, I would instead recommend diverting funds to get a better set of legs than the LN-324C.